Naturally, as we are days away from Joanna's first birthday... 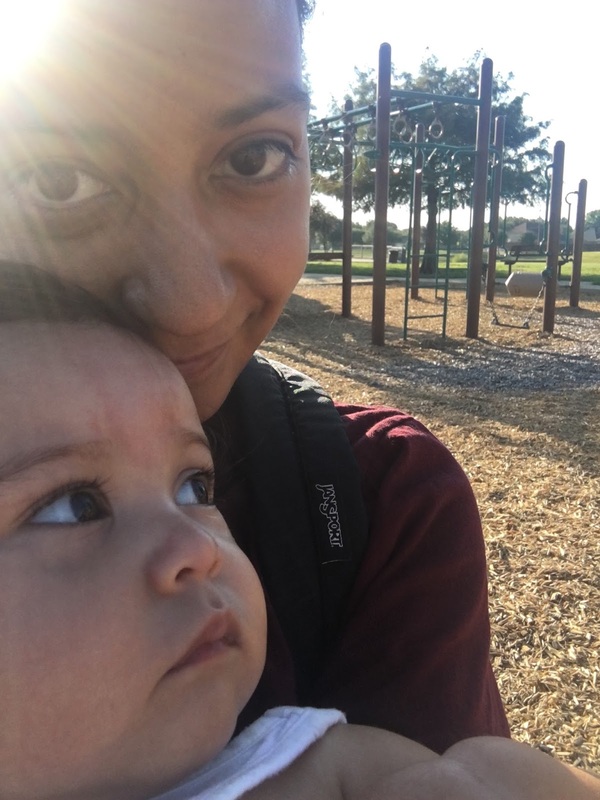 I've been reflecting on parenthood over the last several weeks. It's going to sound SO cliche... but this is the hardest job I've ever done. Like, I'm so happy that she sleeps 11 hours a night but the job doesn't stop after she is down for bed. It just keeps going and going and going and thank goodness I'm a high-energy type of gal because I barely keep up as it is. Parenthood is messy (and my child doesn't even walk or finger paint yet). There is laundry and dishes and dirt (and that doesn't include the dogs... or maybe it does?). I just have to let it go because I am literally living the best days of my life and I don't want to spend it worrying about how clean my house is. My "new life" is exhausting and I absolutely love it. I'm learning to embrace the chaos and live in the moment. Laugh hysterically, cry happy tears, enjoy my wine on the weekends and reflect on the days because they are fleeting. When the alarm goes off in the morning, I'm just rolling with it - accepting that by the time I hit my head to the pillow at night I gave 120% of what I have. I love my husband more now than the day we said "I Do". If I thought I loved my husband before Joanna came along, I had no clue. I had no idea how strong our first year of parenthood would make us. I had no idea how our communication skills would grow through arguments, through venting-sessions, through tears and through laughter. Oh man, do I love that man. Children are beautiful. Absolutely beautiful. Build a support system. We are working on this one. It's been pretty hard since we moved from Tampa, FL to Dallas, TX but I'm destined to find a good, solid support system. Over the last several weeks I've been thanking God tremendously for all of the people he's brought into our lives over the last year - without them I'm not sure how we would have survived. My heart wants to explode just thinking about how quickly Joanna grew in one year. "The days are long but the years are short"... whoever said that, bravo. Now let me go cry in the corner because my baby is going to be a toddler in 5ish days! Forget putting your child "on a schedule" - meal prep is everything. I HATE coming home from work and wasting energy trying to figure out what we are going to eat for dinner. I'm working a lot harder these days at planning meals and prepping food where I can. Plan ahead. I thought I was a planner before I had a child. Now I live by my calendar. My work and personal calendar even overlap so I know when/why I need to leave the office early and I have started preparing weekly for the weeks to come. Flexibility is key. Yes, planning is critical but being flexible in changes to your plan is even more important. Although my job is demanding when I travel, when I'm home it is extremely flexible (I'm not traveling at least 60% of the time). We could not accomplish everything that we do if it wasn't for a flexible schedule at both home and the office. Personal time is necessary. I love to run and it's my outlet. Also, shopping is my outlet :) but I've learned to appreciate my alone time and my quiet time. I've also learned to respect Brad's personal time. Date Night is a requirement. I didn't believe this one before we had Joanna - I took it for granted because we already spent so much time together. Now I'm making this a priority and I don't care how much our monthly bill on "baby sitter" costs because spending uninterrupted time with my husband is necessary. I'm going to be so real and say it again, this stuff is hard people... and it's just the beginning. The crazy Stephanie in me keeps telling Brad, I want three. I want THREE children. That's a logistical nightmare on steroids and I don't care because having a family is the most fulfilling feeling in the world (for me, I'm sure for others there may be other things that fulfills them and that is totally okay). I never thought I would feel this way. I truly believed that I'd get married and do the whole kids thing. In just a few days we'll be celebrating surviving our first year - an entire year of chaos. We sold our home, had a baby, moved to grandma's, moved to Texas, started TWO brand new jobs, I traveled 9 times and hundreds of ounces of pumped milk flown across cities and states. I am so proud of US... but I am also SO tired (maybe that's because I ran 11 miles this morning - 7 of which consisted of me pushing a stroller). I'm not trying to toot my own horn (or maybe I am... trying to show my skeptical self how much we are capable of)... but we survived! Although I am sure that some couples go through far more than we went through. I love you Joanna - thank you for allowing me to be your mama. Thank you for loving me unconditionally.